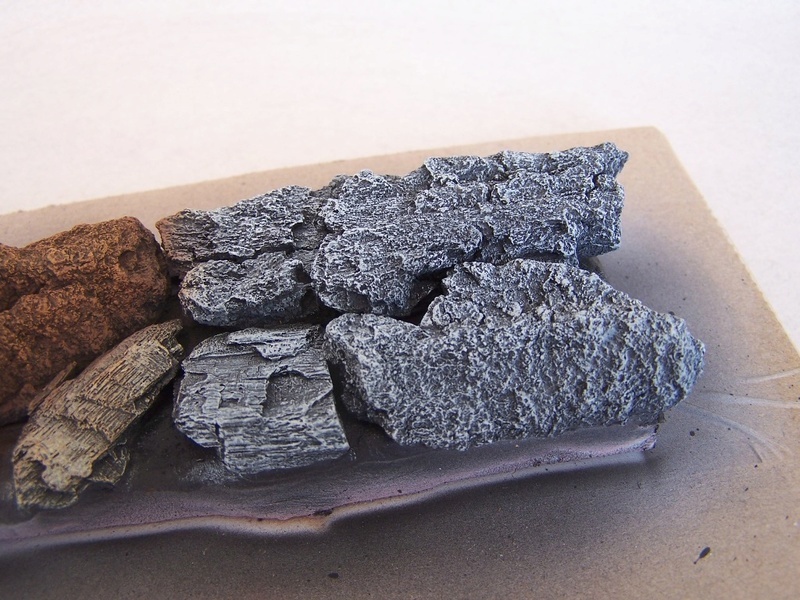 I don't know if this was posted before, but I read about using barbecue charcoal for diorama rocks, so I decided to give a try after a BBQ evening several days ago . It's simple-pick up some charcoal pieces, spraying a primer (in my case Vallejo polyurethane one), then base color depending on the desired rocks and then with dry brush lighter tones. Very realistic. Thanks for sharing. I made this little scene out of Styrofoam covered in Durham's Water Putty. Nice little dio! Would have been super-cool to see some bloody critter hanging out of one of the raptor's mouths. How thick of a layer of the putty did you use? did you have any problem with the putty getting absorbed into the styrofoam, and causing an uneven surface? For those living in North America-- the BBQ rocks Venelin is using (great idea by the way) are not the same as the "Charcoal Briquets" we commonly use here in N. America for outdoor grilling. 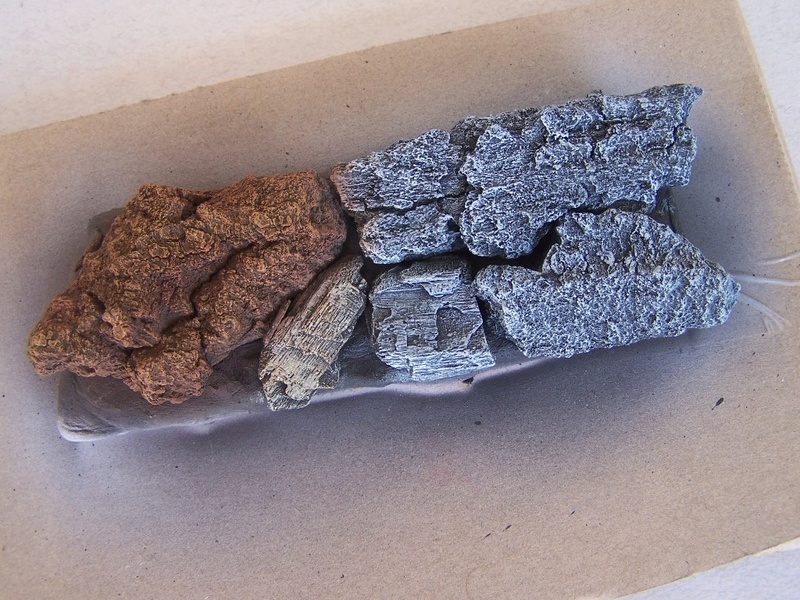 They are more akin to the ceramic extruded "hot rocks" heat retention rock that we use here in natural gas fireplaces and some natural gas BBQs. 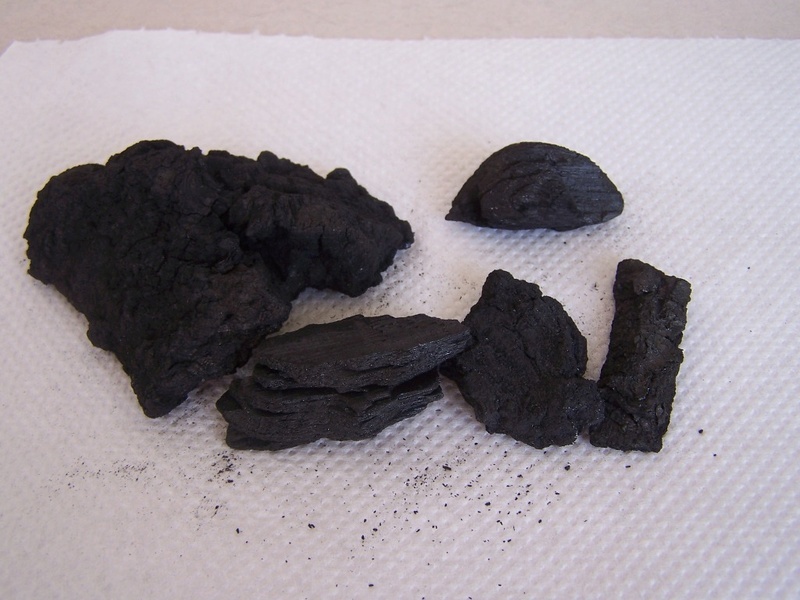 I wouldn't try using the "Charcoal Briquets" variety for this-- as they are pretty fragile after use, and before use they are soaked in flammable Kerosene or a like material that can off-gas indoors. This looks like a pretty good inexpensive idea. I'm a long time train guy and tend to use Hydrocal and a handful of molds, your method looks like it would save some cash. Those are great looking rocks! I'm going to Bulgaria to get a few bags of these. Like Russ said, US BBQ charcoal isn't suitable. Fred, you don't need to go to Bulgaria to buy it, any good fireplace shop or even the big box hardware stores carry the extruded ceramic stone for indoor fireplaces. Might save you an airline ticket. As for pricing, some of those big box stores offer samples of exterior facing fake rock for free, or at low cost which can be used the same way. Here's another old model Railroaders trick (I know you and I are both old model Railroaders-- emphasis on old for me--I can't speak for you!) 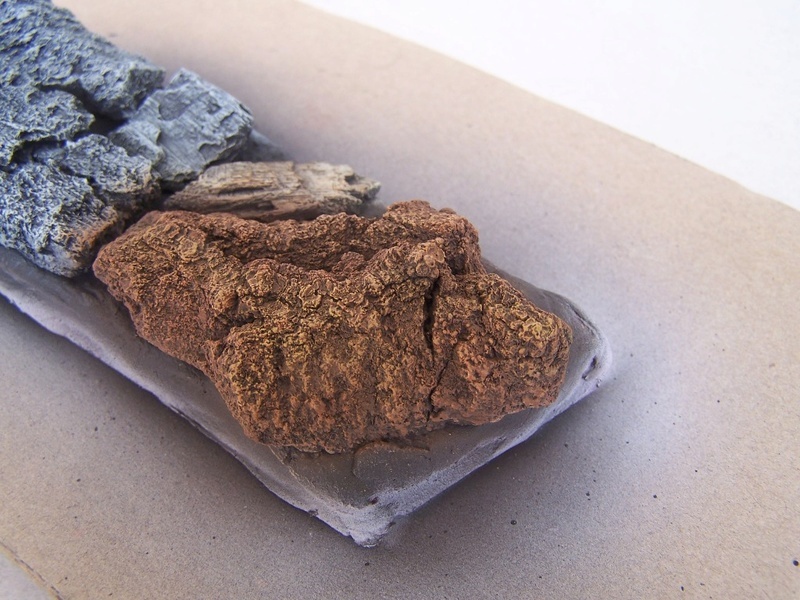 --you can make a latex mold of this material and cast it in hydrocal (plaster for you non-model RRs out there), so that you can have as many rocks as you need. Model Railroaders frequently use one mold to make 4-5 rock faces by alternating the positions of the casts. On the other hand, this material can be carved itself once heated, but it would be more expensive to buy it that way if you needed a lot of rock (as model Railroaders typically do). Charcoal looks great, but his million-times older brother...coal, looks even better, (IMHO). Coal has many small-scale features that mimic large-scale features found in rock outcrops; bedding planes that look just like strata seen in sedimentary rocks, hackly fracture with jagged edges, cracks that look just like jointing patterns, basically everything you would see in a rock outcrop in miniature. 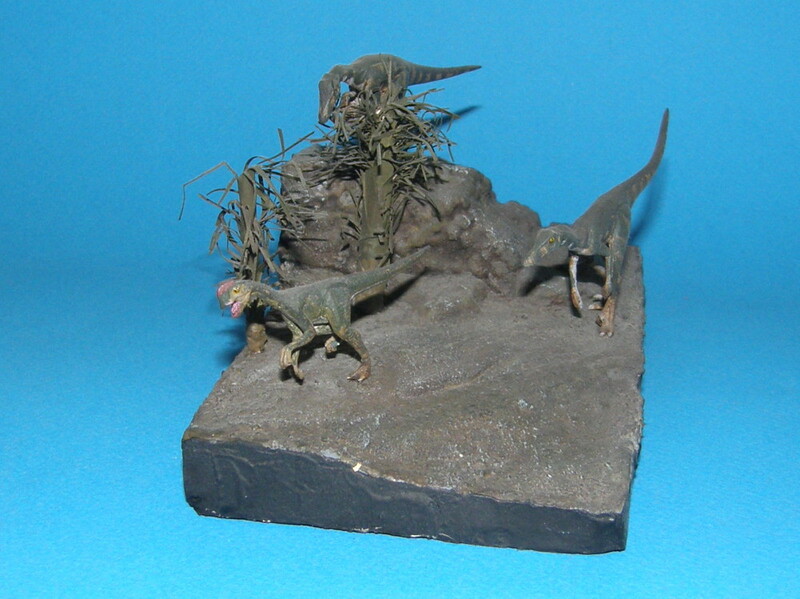 Those rock molds from companies like Woodland Scenics? They are cast from pieces of coal. The only problem is finding it. If you live in a area that formerly had coal mines, this should be easy, a field trip to an old mine dump will do the trick. Obviously, you want to stay out of abandoned underground coal mines or ones that are currently active. If you don't live near coal country, this will be a lot harder to do. Since coal that has been exposed to weathering tends to be rather crumbly, I try to find fresh pieces and cast latex molds from it and cast plaster replicas. You can also just plant some pieces in your groundwork and paint them.